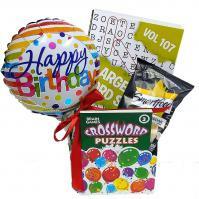 Fun and creative care package delivery. Thoughtful, creative care packages are great moral boosters. Care packages show you care and lets them know they haven't been forgotten. College, birthday, new baby, thank you, get well and all occasion care package delivery. Our snack boxes make excellent college care packages, military care packages, camp care packages, back to school care packages, birthday care packages, healthy care packages, get well care packages and more. Deliver care packages for any occasion. Find care packages for men, women, boys, and girls that can brighten any occasion. Do you know a young person who's leaving for college soon? 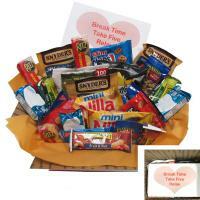 Surprise them with a "going away" care package filled with their favorite junk food. Or, try a gift set with some boredom buster games such as Yahtzee, Checkers, and Uno along with some delicious crunchy snacks. 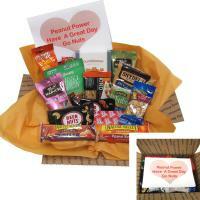 You might also give a sports lover care package or a gourmet food care package if that’s more their style. When you want to show you care, express thanks, or celebrate a milestone in some one's life, these are the times to send a care package by Adorable Gift Baskets. Our care packages enable you to deliver thoughtful, practical gift foods and items to your friend, employee, or loved one in one decorative bundle. These unique gifts are creatively arranged in a variety of containers such as gift baskets, buckets, gift bags, boxes, totes, mugs, pails, and other assortments! Get Well care packages by Adorable Gift Baskets can help cheer a sick loved one with coffee, popcorn, puzzle books, playing cards, pretzels, cookies, and even flavored cough drops! 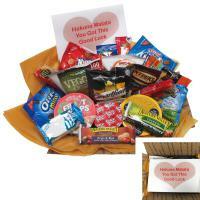 You can have care packages delivered to a distant loved one who has recently had a baby. Our baby care packages include lots of needful products for baby and even a few goodies for mom. If you have an employee with your company that is striving for excellence, show them your appreciation with a specialized care package. Or, help relieve stress by sending your loved one a relaxing spa care package. Adorable Gift Baskets offers multiple care packages for boys and girls with toys, candies, puzzles, games, and fun activity books. We also deliver care packages for birthdays, anniversaries, holidays, Mother's Day, Father's Day, and other special occasions. When you want to send a variety of gifts in a fun, creative arrangement, care packages by Adorable Gift Baskets make it easy. Have our affordable care packages delivered to your home or office, or to your loved one. We make it simple and pleasant to shop for all your care package delivery needs!